Filed under: Bedding plants, Suttons Seeds. 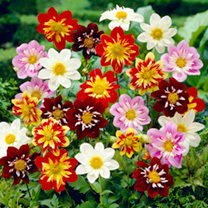 Dahlia Plants – Harlequin Mix from Suttons. A dwarf, early flowering, collarette type dahlia producing a superb array of unusual bicoloured and single-coloured, semi-double and double blooms. Flowers May-September. Height 30-35cm (12-14).